Hand embroidery worked in silk is beautiful, but there are so many silks out there to choose from! 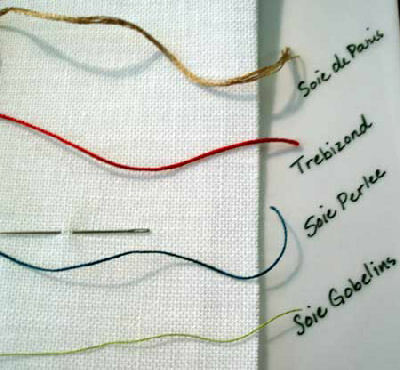 So here are some up-close photo comparisons of a few popular twisted silk threads: Soie Perlee, Trebizond, Soie Gobelins, and Soie de Paris. 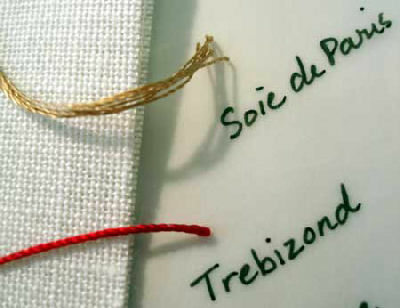 Of the four silk threads mentioned above, Trebizond is the only one not made by Au Ver a Soie. It’s imported into the States by Access Commodities. So here’s a photo of all four silk threads side-by-side. For a bit of a size reference, they’re lying on Edinburgh linen (36 ct) and that’s a #9 crewel needle in the fabric. 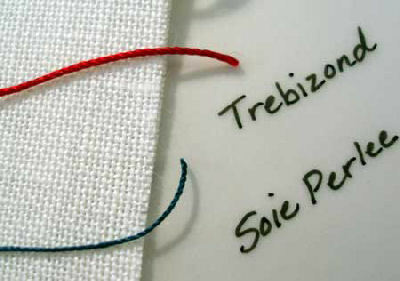 The finest of the four threads is Soie Gobelins, which is a 2-ply twisted silk. It’s a filament silk, which means it’s taken in long filaments straight from the cocoon, has a great lustre, and is strong. It comes in over 100 colors, the numbers of which match the Soie d’Alger color chart. It’s great for counted thread work on higher count linens, and it works fine on plain ground fabric as well. I have a friend who uses it with a teeny, tiny crochet needle to hand-crochet lace, and it’s beautiful! In size, it seems to me to be comparable to a strand of DMC, but the twist on it seems a little tighter, and it’s a lot “smoother” to work with (when passing through the fabric). It fits in a #9 needle with a little room left over – a #10 crewel or embroidery needle would do as well. As with all four of these silks, it’s a little bit “boingy” – but less so than the other three. 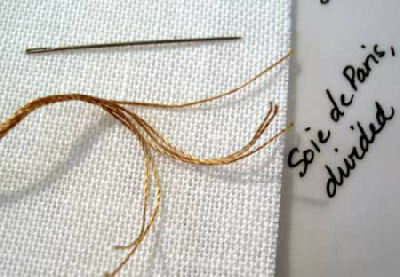 Soie Perlee is the next silk thread up on the list, and it’s the next up in size of these four. It fits fine in a #8 or #9 crewel needle. 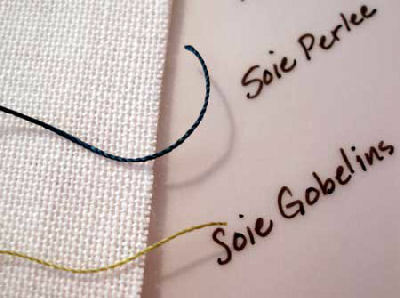 Soie Perlee is a 3-ply twisted filament silk. I would say it’s comparable to a cotton perle #12. It comes in some 365 colors! It’s a favorite for needlepoint and counted thread work, and can be used in regular surface embroidery embellishment, crazy quilting, and whatnot. Next up the line is Trebizond. It’s nice stuff, a lot thicker than Soie Perlee. I’ve read some descriptions that say it’s comparable to a #5 perle cotton. I’d put it somewhere between a #8 and a #5 in size. It works great on 25 count linen. I find it a bit of a squeeze on 36! It works well on 18 mesh canvas for needlepoint. It’s a 3-ply silk, pretty “boingy” when you use it, but really a nice, nice thread. Finally, there’s Soie de Paris, the last one up the line. This is a 6-ply silk, and it’s divisible into individual plies. The individual plies seem slightly larger than the Soie Gobelins – but they may be the same size. You can stitch with one or more plies, just as you can with stranded cotton or silk. Soie de Paris doesn’t seem as tightly twisted as Gobelins or Perlee. It’s got a very narrow range of colors (around 75), and they correspond with the Soie d’Alger color chart, too. You might wonder what the heck you can do with a thread that looks like that – but really, it’s great for adding a different “look” to your satin stitching. The thing about silk is this: depending on how the light plays off it, it looks different. So if you satin stitch a small area with a wavy thread like this, you’ll end up with a nice effect because of the way the light will play off the silk. To follow up on this comparison, I’ll show you some stitches worked in each of them, so stay tuned! I’ve also written up a comparison of flat silks, if you’re interested. 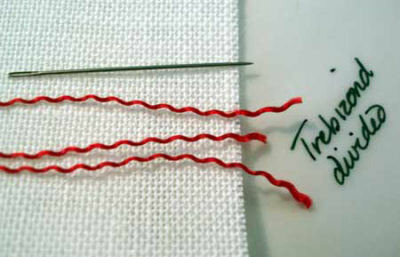 I’ll be working in another comparison of the flat silks this week, adding TESS (True Embroideries Sleave Silk – just like Piper’s Silk) to the comparison. I’m trying some silk threads for the first time and I remember for some stitches it is important to know if they are s or z twisted. What is the twist for the one’s listed in this article and are they all the same or different? Thanks for all the effort you put into Needle N’ Thread. I have enjoyed reading along. Hello. I have been on a near-desperate hunt for a naturally wavy or kinked thread to use for my ocean embroidery. I love the wave in the Trebizond silk thread, however I know they don’t all come this way. Do you have any suggestions as to what type would work and where I could find it? Thank you for the quick reply and the advice. Say I’m on budget, is there anything less expensive that I could purchase at a hobby store? I actually got the idea to use Bokhara couching for my waves from your website (it’s as if you read my mind!). The blue floss you used in that tutorial appears to have a natural wave; what type of thread is that? It did help really and truly, thanks for caring :). gostaria de saber como encontrar estes fios aqui no brasil moro na zona norte de sao paulo. I am thankful for your articles on silk and how to use them as I was just about tearing my hair out! The silk I am using just keeps on sticking to my hands even though I took the nailfiles to my hands to smooth them. I also tried sugar rubs but it was still sticking to my hands. Then I thought why not try gloves? As I did not have any cotton gloves at hand,(so to speak!) I tried the disposable rubber gloves, you know the type that come in a box like tissues. That worked! I don’t exactly like the feeling of rubber gloves, but it makes working with silk so much easier and makes it a lot more pleasant to work with the silk. So, for me, from now on, I will use the rubber gloves. Thanks so much for providing this venue to keep in touch with the International embroiderers. Previous Previous post: Stitch Glasses: a New Concept for Personal Embroidery Items!